That learning comes from Bogdan Markiel, the CEO of DV Systems in Barrie, Ontario, Canada. Co-owners Markiel and Garth Greenough wanted new machines that would modernize their outdated operation, providing additional quality and competitiveness to keep their operations in North America. At the onset of the project, they couldn’t have imagined that supplier relationship would help them rethink their entire machining process. 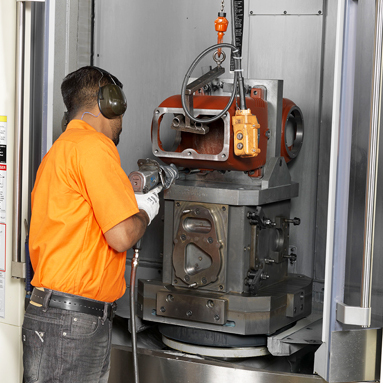 Markiel and Greenough also didn’t realize that replacing three older machines with just one Makino a61nx horizontal machining center would yield a higher number of quality parts in just 75 percent of its previous time. But it did. The company’s motto is “Built Better.” Backing this statement requires extreme confidence in producing parts for its air compressors. In order to build better, Markiel and Greenough are a testament to the fact that the company must have the right horizontal machining technology in place, with the service behind it, ensuring every part is produced accurately. For manufacturers trying to achieve this balance, it often feels like they are taking a leap of faith to make the changes needed to get there. But change doesn’t have to be uncertain. The a61nx replaced three of the company’s previous CNC machines and some manual machines, while operating at only 75 percent of the previous shift. 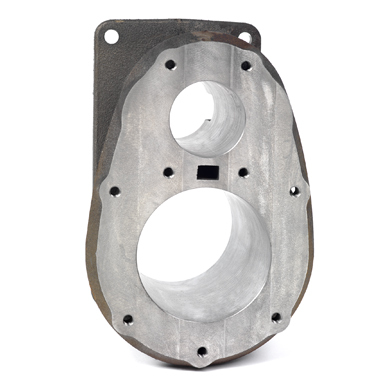 The 40-taper a61nx enables DV Systems to easily cut through gray cast iron, achieving tolerance requirements of plus or minus 0.0002 inch. 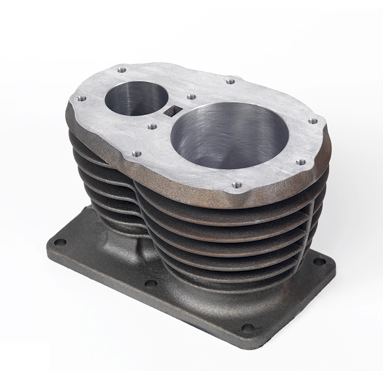 The positional accuracy of the a61nx has enabled DV Systems to hold cylinder roundness tolerances of plus or minus 0.0005 inch and squareness tolerance of plus or minus 0.0004 inch. With the engineering support of SST and the capabilities of the a61nx, DV Systems has been able to execute its vision of producing a full set of parts complete. Because of its new processing, machine capabilities and workflow efficiencies, on one particular product DV Systems has gone from producing four compressors per day to eight per day. DV Systems got its start in 1888 in Toledo, Ohio, when physician Allen DeVilbiss invented the spray atomizer, introducing an easier way to apply medicines to people’s throats. Over the years the company’s product line expanded. It developed the spray gun and eventually began manufacturing air compressors in Barrie in 1954. The air compressor division became an independent company in 1998, taking on the name of Devair. In 2006, Markiel and Greenough purchased the company and shortly thereafter renamed it DV Systems. Today the company employs 42 at its headquarters in Barrie. It has a new facility in Mooresville, N.C., dedicated to serving a growing customer base in the United States, which currently comprises 20 percent of company sales. Part of DV Systems’ rebranding and growth strategy includes becoming more competitive. It knew that moving production overseas to be more cost-effective—as many of its competitors were doing—was going to affect the quality of its products. Quality may be its number one concern, but it also places a high value on turnaround time. DV Systems manufactures four types of heavy-duty air compressor pumps and 500 different models of air compressors, and it must produce these quickly. It needs the ability to easily change production from one model to another. When it considered product quality and turnaround time in addition to logistics, fuel prices and properly meeting voltage requirements for these compressors, DV Systems knew it had to maintain operations in North America. However, its equipment was severely outdated and unreliable. “We had been using the same equipment for decades,” said Greenough. “It broke down often, resulting in part shortages. 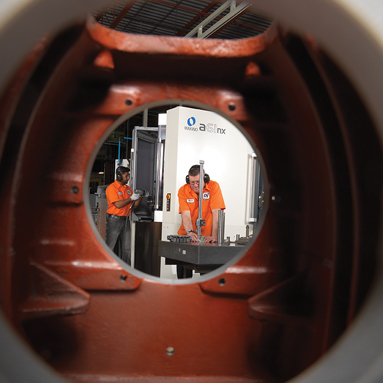 We knew it would take new horizontal machining technology to meet today’s needs. To be competitive, we needed to rework our processes in a way that would produce the best quality parts while accommodating lean manufacturing. This required finding the right partner to help us plan for and get our employees, who had been working with the same equipment for decades, comfortable with new machine technologies. Understanding DV Systems’ need for strong support, SST-Canada application engineers engaged the company at a high level right from the beginning in order to develop a solution. Their approach involved spending several days at DV Systems, evaluating current processes and performing time studies. With this updated lean method, DV Systems could make products to order and acquired the ability to quickly change from one model of compressor to another. For a year, SST-Canada and DV Systems worked together to develop an implementation plan. In addition to analyzing ship processes, they paid special attention to improving machining methods. Its new processing method would help DV Systems machine all components of an air compressor—an entire set of parts at once—on each fixture, so that each could be assembled complete. 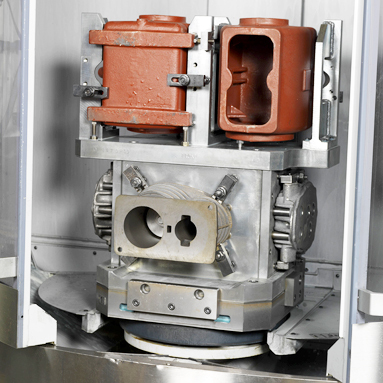 With the old method, the company had dedicated fixtures for each part and would machine identical parts on the same fixture, running large volumes at a time before switching fixtures to produce the next set of parts. This process would result in having dozens of parts from different families sitting idle in work-in-process inventory until all part families were complete. With this updated lean method, DV Systems could make products to order and acquired the ability to quickly change from one model of compressor to another. To accomplish this goal, SST-Canada brought in Sandvik to develop a tooling package, and ABA Machining & Welding to develop new fixtures. “We knew that we didn’t have the knowledge or expertise in-house for the tooling and fixtures,” said Warren Henley, plant manager at DV Systems. “But through SST-Canada’s recommendations, these three companies developed this new process into a complete solution, ultimately making our vision happen. They truly worked together to get the solution we needed. If we had a meeting with one of these companies, all of them would show up. There were no egos—everyone worked for the common good. Knowing it would be using this new horizontal machining center, DV Systems also began digitizing the machine programming process. It went from drawing parts and programming at the machine to using advanced software to create its intricate fixtures in three-dimensional models. Its approach enabled DV Systems to put its part models right into the Makino environment for production. What has resulted from all of this new technology is DV Systems’ ability to execute its vision of producing a full set of parts complete on the a61nx. It can now produce a new compressor with each completed fixture. The new method helps the company reduce work-in-process inventory. 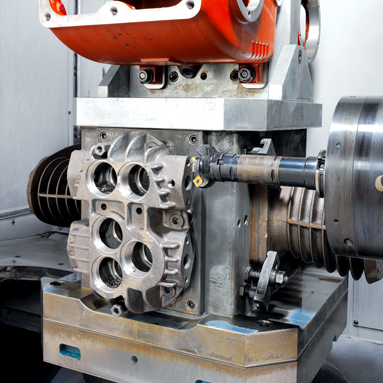 In addition, its ability to machine a full set of parts means that if DV Systems receives an order on Monday, it can ship a completed compressor by Friday. “We never would have been able to do this, had we shipped our production overseas,” said Markiel. “Right from the beginning, we realized that the capabilities of the a61nx were better than we could have ever imagined. It has not only removed our previous stress about downtime but also contributed in achieving a new level of manufacturing. 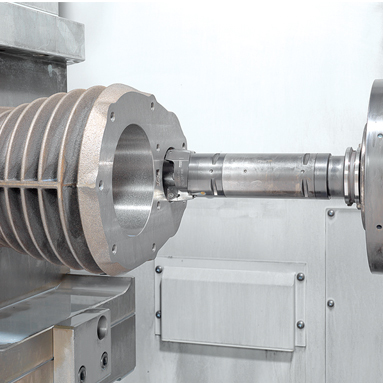 Challenging bore features are easily achieved. 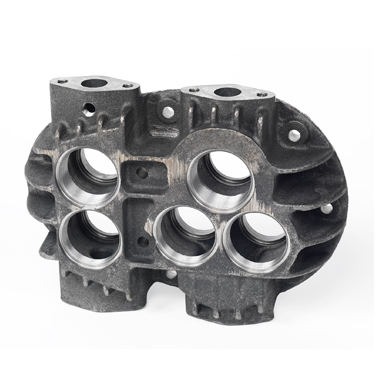 DV Systems is producing parts from gray iron with a Brinell hardness ranging from 187 to 241. The 40-taper a61nx can easily cut through this material and achieve tolerance requirements of plus or minus 0.0002 inch, with cylinder roundness of plus or minus 0.0005 inch and squareness of plus or minus 0.0004 inch. “When we chose the 40-taper machine instead of the 50-taper, we were concerned about not having enough torque for a 4.5-inch bore, but we don’t need to worry about vibration,” said Henley. “In fact, the 40-taper machine works better than our 50-taper did. Because of the machine’s accuracy and rigidity, we have virtually no scrap. With this new process, we no longer live in fear that a machine on our production line may go down or compromise the precision parts it produces; we are more accurate than ever. 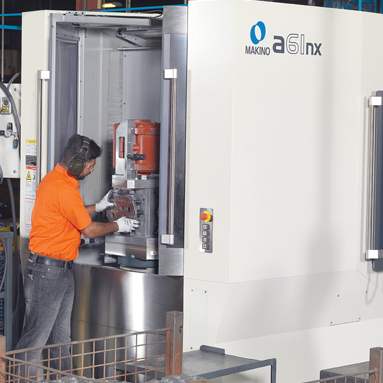 The a61nx replaced three of the company’s previous CNC machines and some manual machines. It also operates using only 75 percent of the previous shift. No changeover time is required, because each fixture produces all components necessary to assemble a new compressor. This improved efficiency has provided operators with extra time to take on additional roles. This situation is a win-win for everyone, especially because at DV Systems, what matters most is recognizing its people. This combination of skilled employees and precision machinery has enabled DV Systems to remain competitive and keep jobs in Barrie. With strong growth in Canada, the company can now focus on U.S. expansion, where it expects to triple sales in the coming years. “As a result of our new capabilities, we can confidently operate in a lean environment, building the best product possible with the best equipment we could have asked for,” said Markiel. Heavy-duty, durable and dependable, compressed air solutions from DV Systems are built to withstand the most demanding industrial environments and are used in a variety of applications—from mechanical bays and garage areas to HVAC controls and lab stations. The company is Canada’s leading designer and manufacturer of energy-efficient air compressors. It also produces refrigerated compressed air dryers and air filters. A dedicated team of engineers at DV Systems focuses solely on R&D efforts, whether designing a new line of 200-horsepower air compressors or developing products with noise levels as low as 63 decibels. The company’s heavy-duty industrial (HDI) series piston air compressors range from 0.5 to 30 horsepower (HP), and are backed with an unprecedented seven-year warranty. Built to last for decades, these compressors are known as the workhorses of the industry and boast extra-heavy cast iron design, oversized components, and the ability to run at very slow speeds while providing high air delivery at 75 to 80 percent duty-cycle operation. High-efficiency rotary screw compressors operate at 100 percent duty cycle—ideal for continuous-use applications, where reliable, dry and clean compressed air is required. These products range from 5 to 100 HP, and are backed with a five-year limited warranty. These air compressors are available in stand-alone base, tank-mounted or packaged configurations, complete with air receiver, dryer and air filters. Products from DV Systems maintain U.S. and Canadian certifications and have been “Built Better” for over 100 years.